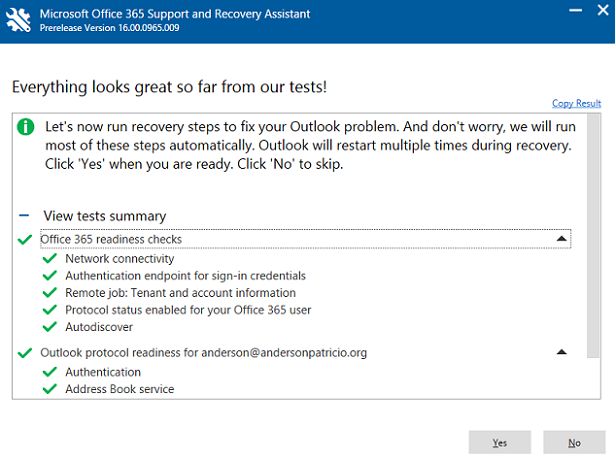 When planning connectivity between clients and Exchange Server/Office 365 the administrator has several tools available to test and validate the process. The Microsoft Team also provides a lot of bandwidth calculators that can help designing the proper solution. In this article, we are going to explore some of the tools available to help on the network bandwidth requirements for either on-premise implementations or Office 365 transitions. Using Exchange Client Connectivity Bandwidth Calculator, the administrator is able to define profile type (Light, Medium, Heavy and Very Heavy), the environment type and Time Zone information. The result will be a complete table with the network bandwidth (from exchange to client and vice-versa) requirements, recommended maximum network latency and number of TCP Connections expected for the workload entered. On top of that a graph predicting the bandwidth utilization throughout the day will be displayed. This test is one of my favourites and performs several tests within the same tool. The drawback of this test tool is that it requires java, and the first step is to download it from here. Although this tool may be replaced in the near future, it is still a great tool for administrators and summarizes all requirements in a few tabs. After installing Java on your machine, click on one of the sites based on your location, keep in mind that Office 365 user will be located on the same region where you define your initial subscription. The following site provides datacenter locations based on your Region. In the first page, type in the Office 365 tenant name, we can use the first domain created during the initial subscription which is <name>.onmicrosoft.com. Then, click OK and wait a few moments for the tool to test all network related items between the computer that is running the tool and the datacenter. Route: includes all network routing information, provides a list of all settings checked and a map of the location. 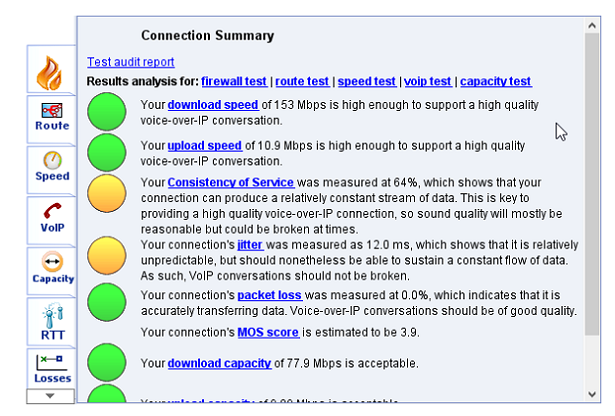 Speed: it compares the current download and upload speed with several technologies (from 14.4 modem to T4) and provides round trip time, consistency of the connection and so forth. 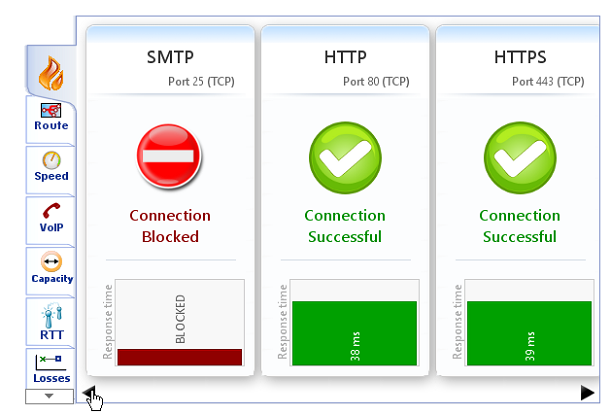 The first tab is the Firewall, and in a glance we can check which protocols are allowed or not in the firewall and its response time. At the end of the test, a Connection Summary will be available and it will list all items checked and they will be assigned a color based on their status (green, yellow and red, where green is okay, yellow is attention and red requires immediate attention because it is not working properly). 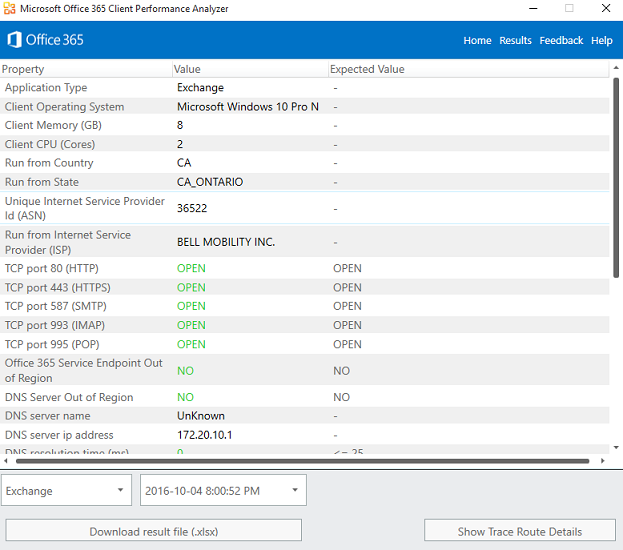 Another option available is the Office 365 Performance Analyzer which will be replaced in the near future, however it is still a good tool to measure performance. To download the tool, click here. 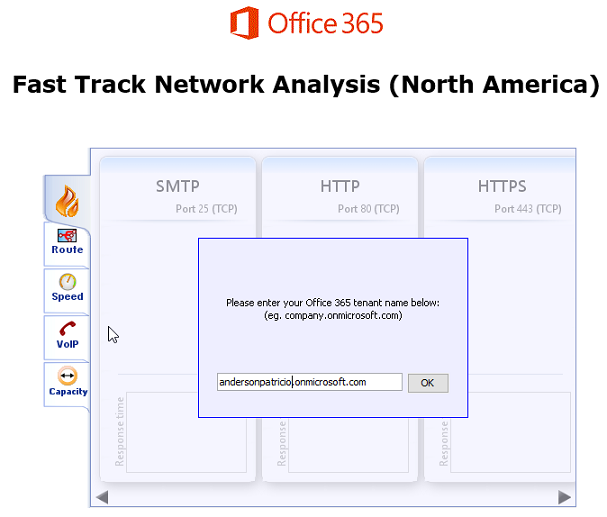 The tool checks the network performance between the client that is being run and the Office365 datacenter, checks ports and measures bandwidth available and so forth. The installation process is straight forward and just requires the acceptance of the license agreement. In the initial page, click on either Run Exchange Analyzer or Run SharePoint Analyzer. 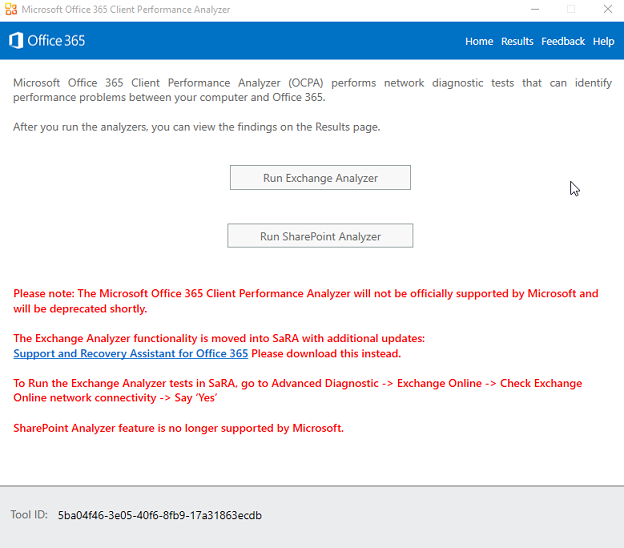 In this Tutorial we are going to run the Exchange Analyzer, a pop-up asking for the e-mail will be requested, type in your e-mail address in Office 365 and click OK and wait a couple of minutes. After a while, a new page with the results of the test will be displayed. The administrator can analyze the results and compare the actual values with the expected values and start doing some troubleshooting and/or design decisions. One of the newest tools available is SaRA and it can be found here. However, this tool is more related to specific issues on the client side and as part of the process of identifying the issue a series of tests is performed, such as network connectivity, authentication, protocol, services and etc. Test results from SaRA tool. 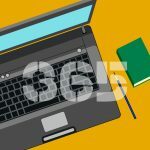 In order to properly design any on-premise implementation or transition to Office 365 the administrator must account the network bandwidth requirements and in this article we went over some of these tools to help the administrator.